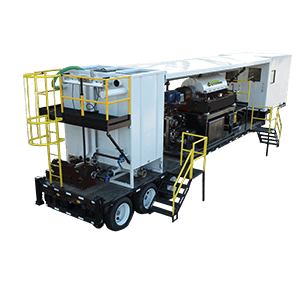 Portable Dewatering System – Fluid Systems, Inc.
48′ Triple Axle Drop Deck, Trailer/Air Ride, FET, DOT, and four Electrical Powered Leveling Jacks. OSHA approved handrails and stairs area also included. Pumps 1 ea 2 x 3 x 13 Transfer Model 250 with 40 HP Electric Motor 460V/3Ph/60Hz for fluid transfer. 1 ea hydraulic 3” hydraulic pump and 1 ea 2” hydraulic pump to feed the high-speed centrifuge.